Taking the Mystery Out of Raw Feeding: Part 2 in a Series. Focus on the fact that food is food. Whether you’re human, dog, cat, horse or parrot, we all eat food. What matters is how much protein, fats and carbohydrates you put together, and the vitamins and minerals added depending on the species, i.e. dog vs. cat. In the modern world, with its many carcinogens, one in three dogs will contract cancer. Just as with people, the addition of highly colored fruits and vegetables to a diet can cut the rate of cancer in dogs by 30%. Is it safe to feed my pet a raw diet? Safety issues are probably the biggest concern for pet parents when considering a raw diet for their pets. This is not a surprise considering how much contradictory and flat out misinformation exists on the subject. You’ll find an equal amount of information that supports raw feeding as well as discourages raw feeding. 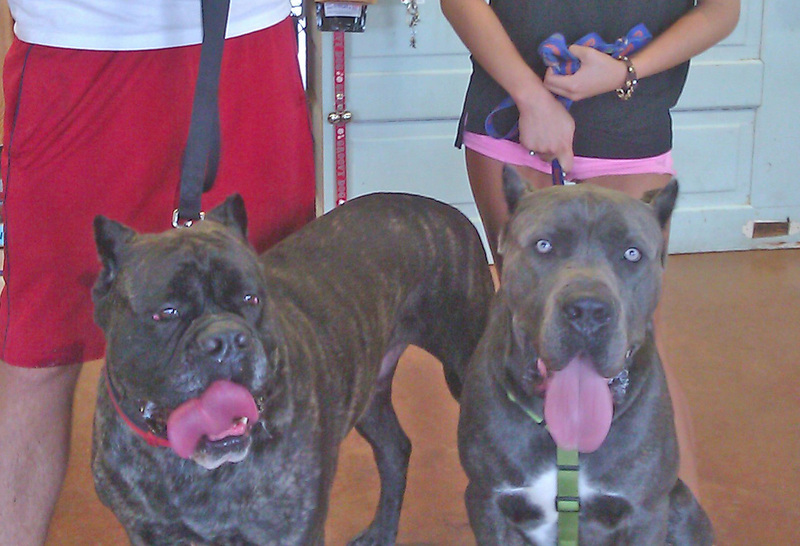 Meet Kato and Drake, two Cane Corsos both on a raw diet with products found at Groovy Cats & Dogs. The risk involved in feeding a raw diet to your pet is minimal provided you understand what they are and how to manage them. Many veterinarians are not advocates of the raw diet. Their concern, understandably, is that pet parents may not be fully informed about just what a raw diet consists of, and how to properly prepare a raw diet. Throwing down a chunk of raw chicken or beef with some rice in a dog’s bowl is not a raw diet. Veterinarians are also rightfully concerned with the fact that if not properly prepared, a raw diet will lack in certain nutrients, and those deficiencies may eventually make the dog ill.
Concern #1: Potential for contamination by various bacteria (same risks to humans as when cooking your family a chicken or meatloaf dinner); when feeding a commercially prepared raw diet, your risk is likely lower than when handling meat from your grocer or butcher. Solution: Any safety concerns regarding bacteria such as salmonella, E-coli or other types of bacteria when handling raw meat are mostly aimed at the humans handling the raw meat, not the family pets. As far as the risks to humans, take the same precautions as handling raw meat to prepare a chicken dinner for the family. Avoid cross-contamination, wash all surfaces and hands thoroughly, for a minimum of 20 seconds with warm soapy water. When it comes to pork, there are additional safety precautions due to potential of trichinosis, so it requires extra care by either freezing it for a longer period of time, or cooking it thoroughly. To read more on safety issues when handling raw meats, visit this link, Safe Food Handling: What You Need to Know. Concern #2: Your pet and the type of chewer he is will dictate the types of raw meaty bones, if any, you give to your pet. Solution: Most do-it-yourself raw diets call for a certain percentage of raw meaty bones to be fed as part of the diet. Bones and cartilage contain good nutrients for pets such as fats, calcium and phosphorous. Bones also provide a wonderful recreational exercise for pets that is hard to beat. Additionally, bones help keep a dog’s teeth sparkly clean. Dogs were designed to chew, tear and shred. So when buying bones, it is essential to make the right choices based on what kind of chewer the dog is in order to minimize any risks. Is the dog a chomper or a gulper when eating food? Has the dog displayed tendencies to swallow large objects whole? Dogs displaying these tendencies are not good candidates for bones. Dogs can be trained to chew properly, but plan on committing enough time to train the dog and gain the confidence to add bones to the dog’s diet. Another area of concern: some dogs become very food aggressive over bones. They become fixated on them. Many a dog fight has broken out over a bone. The best way to deal with this issue is to separate the dogs in a multiple dog family and/or place them in their own crate. Never leave a dog and a child alone together while the dog is eating. An alterative to feeding bones is to add bone meal (bones ground up into a fine powder) as a supplement. There are several options on the market today which have the meat, bone and cartilage all ground up together. Concern #3: Does your pet have a compromised immune system? Take that into consideration and monitor carefully when starting out on a raw diet; consider raw diet alternatives such as dehydrated raw and freeze dried raw. Solution: The current health of the dog must be taken into consideration before going on a raw diet. If the dog has a compromised immune system (meaning the body does not have the ability to defend against illness or medical challenges such as heart disease, diabetes or cancer) precautions should be taken. This doesn’t mean that a raw diet is totally out of the question. It may require a little longer time to transition the dog onto a raw diet. Another consideration may be to utilize one of the raw alternatives available at holistic pet stores to make it easier for the dog to handle and digest. Another option may be to cook the dog’s food to help him transition off commercial kibble and then ease into raw. Consider easy-to-prepare meals by Dr. Harvey’s, The Honest Kitchen, Grandma Lucy’s, Stella & Chewy’s or SOJOS. It’s always a good idea to seek guidance from a holistic veterinarian, homeopathic veterinarian or a holistic nutritionist experienced in nutrition for companion animals. Adjustments may be required throughout the process, and a supportive professional will assist to achieve the desired goals. Cats and dogs have different digestive systems than humans. Things that we eat safely can make our pets sick and vice versa. Generally speaking, dogs and cats have a much shorter digestive tract than humans. A pet’s digestive system is able to handle raw meat better and food is processed in their digestive systems much more quickly than humans. Also, cats and dogs have a higher level of acidity in their systems, making it harder for the bacteria to grow and multiply. Many commercially prepared raw food diets available today pose even less risk for bacteria because more care is taken to remove potential pathogens. Follow the same safety precautions as suggested by the Food & Drug Administration for handling raw meat in the kitchen when preparing a family meal. Is a raw diet balanced and complete? Most commercially prepared raw diets are already completely balanced with the right levels of protein, fats, carbs, vitamins and minerals. Certain brands or formulas are called “prey model.” These typically only include meat, ground bone and offal, or organ meats. When starting out, stick to the complete diets that include fruits, vegetables and vitamins. (We’ll revisit prey model and some different approaches to raw feeding, as well as preparing home cooked meals for pets in Part 3 of this series). Proteins and fats will vary based on the different formulas. Different meats have different protein and fat levels, so based on what kind of meat is in the formula, these levels will vary. Most people start out with chicken, turkey or beef. If the pet has a known food allergy he may need a unique or novel protein like rabbit, goat or pheasant. Novel proteins are becoming increasingly more available in commercial raw pet foods for pet parents whose pets have severe allergies. Some popular commercial raw frozen diets include: BARF World (stands for Biologically Appropriate Raw Food), BRAVO, Northwest Naturals, O.C. Raw, Oma’s Pride, Primal Pet Foods, Stella & Chewy’s and Vital Essentials. Another consideration would be to start off with a dehydrated or freeze-dried formulation. I recommend Dr. Harvey’s, Grandma Lucy’s, The Honest Kitchen, Stella & Chewy’s, Primal Pet Foods and SOJOS. The main difference between raw frozen and dehydrated or freeze-dried foods is the packaging process. Raw frozen has never been cooked. The foods are chopped, mixed and frozen. Just thaw and feed. Freeze-dried foods have never been cooked. The foods are chopped, mixed, and then forced into a hard freeze. Simply rehydrate by adding water and allowing the mixture to soak for about 30 minutes (for easier digestion) before feeding. Dehydrated has been “gently” cooked with a very low temperature, which removes the moisture and leaves many of the natural enzymes intact. Any of these options are easy to handle. The dehydrated/freeze-dried formulas are great for traveling with the family pet as they are lightweight and can be prepared easily with minimal space and utensils. How do I transition my pet to a raw diet? Many people make the mistake of switching their pet to a new diet too fast, resulting in gastrointestinal (GI) upset and/or diarrhea. Whether you are switching your pet to a raw food diet, or just a new brand of dry food kibble, you should always ease them into their new food to minimize GI upset. Raw food is processed differently than kibble, so avoid feeding raw and kibble together. It will confuse the body and likely result in excess gas. The best way to transition your pet to any new diet, is to feed the new food as a treat at first. On day one, try giving the new food as a treat a few times throughout the day. Watch the poop. If the poop remains normal, then continue using the new food as a treat throughout the day for the next several days. After a few days with the poop remaining normal, replace one meal with the new raw frozen diet. I recommend feeding the raw meal in the morning, and a kibble meal in the evening. If your pet handles the one raw meal per day for several days, then it is safe to switch completely to the new raw diet. Now, if your pet has only eaten one kind of food for their entire life, or for a number of years, you will need to slow the process down and transition over a longer period of time. Allow your pet’s gut to learn to manage this new food type. It may need some additional support, such as probiotics and/or digestive enzymes. We’ll talk more about these and other supplements in Part 4 of our series Taking the Mystery Out of Raw Feeding. So, what is the difference between commercially prepared raw diet and do-it-yourself raw diets? Most commercially prepared raw diets are already balanced with the proper ratio of protein, fats, vitamins and minerals. When you do-it-yourself at home, you buy the meat, add the proper ratio of fats, carbohydrates and vitamins and minerals. In the beginning it can be overwhelming for some people. It is not a question of what is better for your pet — it is a question of what are you most comfortable feeding. Most pet parents just starting out feeding raw, start with a commercially prepared raw diet. Be sure to select a “complete and balanced” diet. There are some products available that do not include anything but meat and bone, so that is not considered a complete diet. If you buy a complete diet, there is no guesswork involved. You just determine how much your pet needs to eat on a daily basis and you feed the proper portions. I encourage my customers to start by feeding just one meal of raw per day, feeding the raw meal in the morning and the kibble in the evening. When you become a little more comfortable feeding raw and see your pet thriving on their new diet, you will probably feel more comfortable putting it together yourself. Most of my customers come back eager to learn more after a few short weeks of observing their pet on a raw diet. They see their pet(s) more eager to eat, with shinier coats, brighter eyes and generally renewed healthy, vibrant demeanor. When should a raw diet be avoided? If your pet has cancer, a suppressed immune system, advanced liver or kidney failure, pancreatitis or serious digestive issues, then it is probably best to avoid a raw diet. Start with home-cooked or a dehydrated or freeze-dried alternative raw option that will be easier for your pet’s digestive system to handle. If your pet has any of the conditions mentioned, I strongly suggest you seek the advice of a holistic or homeopathic veterinarian. In Part 3 of our series, we’ll discuss how to prepare meals from scratch for your pet. In other words we’ll cover how to make do-it-yourself meals in your own kitchen. We’ll cover raw and home-cooked meals. The series, Taking the Mystery Out of Raw Feeding is a contribution by Yvonne Guibert, written exclusively for The New Barker dog magazine. Yvonne is the owner ofGroovy Cats & Dogs, an all-natural pet boutique located in Tampa, Florida. Their focus has always been on all natural food and treats for cats and dogs. To find the products listed within this article, call or visit your local, independent pet retailer: Animal House Pet Center, St. Petersburg/727.328.0503; Dog Mania & Cats, Dade City/352.457.9616; Fluffy Puppies, Clearwater/727.446.7999; Groovy Cats & Dogs, Tampa/813.265.1333; One Lucky Dog, St. Petersburg/727.527.5825; Paw Paws Pet Boutique, Madeira Beach/727.329.8789; Pawsitively Posh Pooch, St. Petersburg/727.892.9303; Pet Food Warehouse, St. Petersburg/727.521.6191; Pet Supplies Plus, Pinellas Park/727.541.1199; Pet Supplies Plus, Clearwater/727.726.5544; Royal Pets, Tampa/813.448.6744; The Doggie Door, Winter Park/407.644.2969; The Green K9, Mount Dora/352.729.6172; Wet Noses Boutique, Sarasota/941.388.3647.